Carrickbyrne Hill (Carraig Bhrain) a public woodland, is noted for its aesthetic and recreational value. The geology of the hill is Ordovician granite – these rocks were formed during volcanic activity about 400 million years ago. 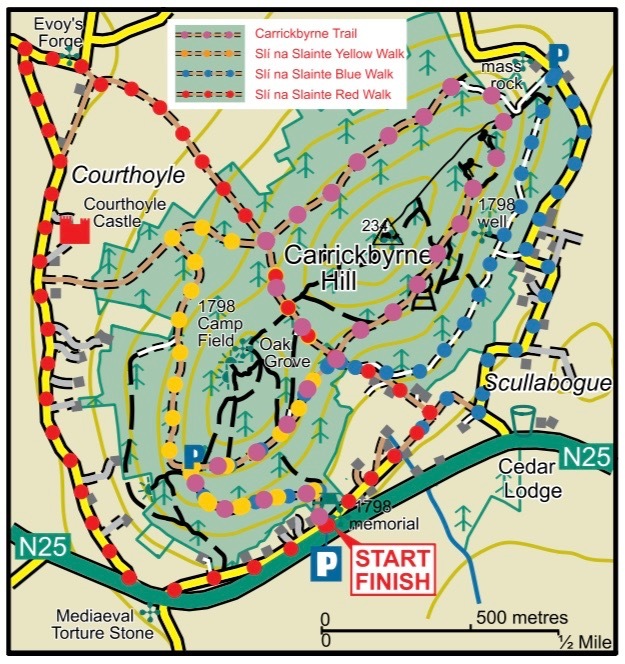 Carrickbyrne Hill features three looped Slí na Sláinte routes individually waymarked – starting at the trailhead in the main car park/picnic area. These routes provide 12.5km of mixed forest trails offering peace, tranquillity and breath-taking views of Mount Leinster, the Blackstairs and the surrounding countryside. This area was once part of the Jeffers Estate and an important landmark during the 1798 Rebellion. United Irish insurgents, under the command of Beauchamp Bagenal Harvey, assembled in an area of oak wood within the forest known locally as Camp Field on June 4, 1798 to prepare for the Battle of New Ross. Other important historical landmarks include the site of a hedge school and a mass rock which can be found on the north-eastern slopes. Significant archaeological sites in the forest include standing stones, a forge, a cave, and the site of a castle. Directions: From New Ross take the N25 for Wexford, for about 13km, Carrickbyrne Hill car park/picnic area is situated on the left hand side of the road. From Wexford town approx 23km on the right hand side of the N25.